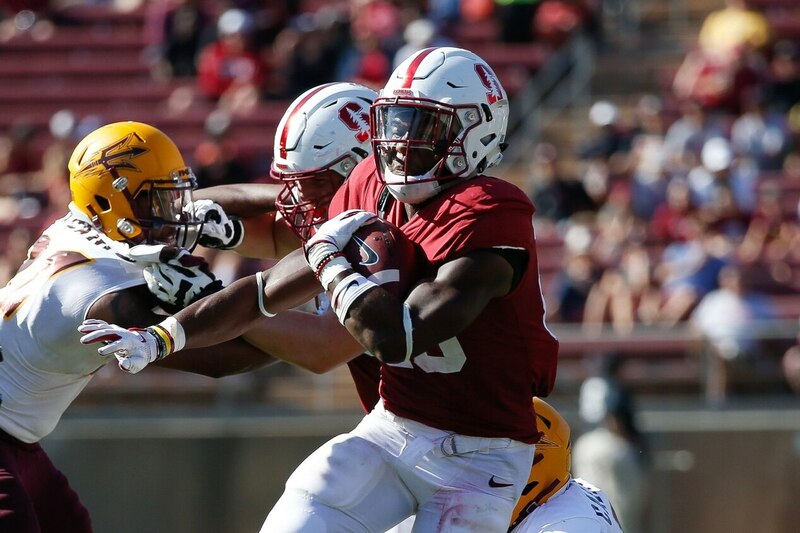 After being bottled up for most of the evening against Cal, Stanford running back Bryce Love finally got loose and romped 57 yards for a touchdown. THERE. HE. GOES. @Blovee_20's eleventh TD rush of 50+ yards extends the Cardinal lead! That touchdown run represents a couple of big-time personal achievements for Love, the Heisman candidate who seems to break a big one every single game. Additionally, Love broke Stanford’s school record (previously held by Toby Gerhart) by scoring a rushing touchdown in 12 straight games, which is also the longest streak currently in the FBS. Unfortunately, Love, who’s been dealing with an ankle injury of late, was shaken up in the third quarter and had to be seen in the medical tent. At the time of this writing, he has rushed for 101 yards and that touchdown on just 14 carries, helping Stanford hold a tentative 17-14 lead.